Here at Fonda Lola, we aim to share Mexican food With locally sourced ingredients, our dishes are healthy and delicious. 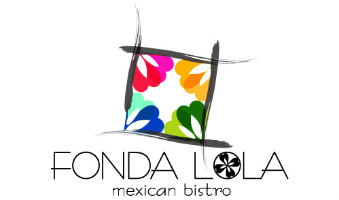 Fonda Lola is the passion project of a Mexican expat and is named after his beloved grandmother, Lola. Lola was spicy and saucy and she taught us to do what we love: To make people happy through food and drinks like only the "abuela" could. Lola would be very proud of this funky little Fonda (the Spanish word for casual bistro). Stepping into Fonda Lola feels like a trip to a beach front Mexican cantina. We feature rustic decor, painted ceramics, and other treasures brought from Mexico to create a bright, cosy space alight with color and joy. Gracias! We're already waiting for you! House infused strawberry+cumin rum, mint, lime and splash of soda. This is top notch! Bulleit bourbon, Ancho Reyes and almond liqueurs. Smoked to order with applewood and served with soda. "And I drink to myself... what a wonderful world"
Soda water, coke, diet coke, ginger ale.